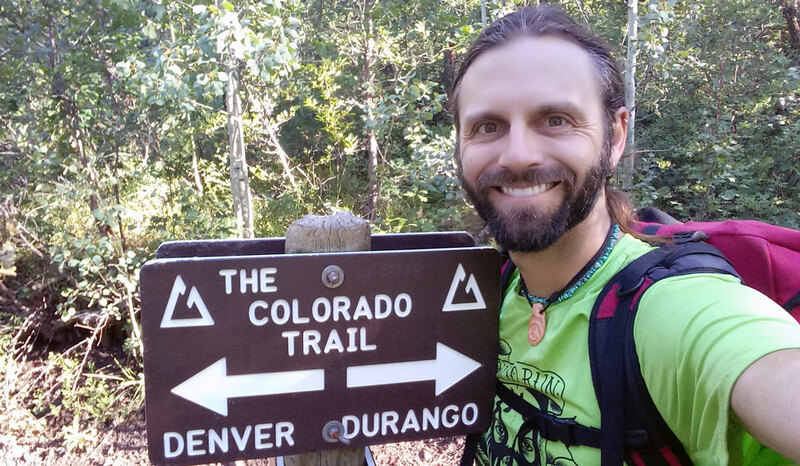 My goal was to hike the 485 mile Colorado Trial in less than 14 days. Mother Nature had other plans. While contemplating an upcoming 100 mile running race I remembered how well prepared I was for ultramarthons following my Appalachian Trail Thru-Hike. Doing the CT fast and light sounded like the perfect training plan. I packed my gear, shipped a food resupply, and arrived in Durango via a 13 hour Greyhound bus from Denver. A woman and her two boys offered me a ride to the trail and I found a quiet stealth camp for the night before starting my two week odyssey. Day 1 was going to be tough. Heck, days 1, 2, and 3 were going to be uncomfortable. I planned 2 runs of 7 days of food…that’s 18 pounds each! I kept my base weight low, but still walked out of town with 32 pounds on my back. Ugh! I hiked up through a narrow gorge and over a few alpine passes with gorgeous vistas. Several thunderstorms rolled through and one caught me exposed on a ridge for several miles before I hiked back below treeline. I covered 36.5 miles in 14 hours and set up my tent at dusk on a cliff looking across the Rockies. I was exhausted, excited, and ready for more. The sun made a morning cameo and quickly dried my wet gear. I crossed a 12,000 foot pass and ran down with 30 pounds on my back. By the time I crossed the next pass the clouds rolled in and started to grumble. The sky was spitting rain and I kept an eye out for lightening while putting one foot in front of another. I’d walked through days and days of rain on the AT and am used to sloshy shoes and wet layers, but this was going to be different. As I descended from 12,500 feet in the rain I couldn’t keep my body temperature up and started shivering, not good. I hiked 34.5 miles in 13.5 hours before stopping to pitch my tent, crawl in, shed the wet layers, and climb into my sleeping bag. Everything was wet. Even my dry bags had water in them. My torso length sleeping pad was dry by my feet rested on my backpack and started to saturate my down sleeping bag, not good. After a cold wet night my sleeping bag had taken on more water. I turned on my phone and searched the forecast for sunshine to dry it out. The weatherman called for 5 days of rain. I’d be climbing to 13,000 feet with rain layers I knew weren’t working, water in my dry bags, and a sleeping bag that was losing its ability to keep me warm. I sat on the mountain contemplating my options and decided to bow out and head home. You never know your limits unless you push yourself to them, and sometimes beyond them. It wasn’t an easy decision, and those who know me know that I regularly get myself into situations that can be a bit dicey. This time I decided it wasn’t worth the risk. I hitchhiked to Durango, rented an expensive car, and drove back to Denver with my tail between my legs, but, it was the right decision. Clothing: I used my rain gear from the AT, which includes a lightweight rain jacket and 4 ounce wind pants. I don’t mind being wet, but I need to be warm. Next time I’ll take one more upper thermal layer, fleece or long sleeved shirt, and a heavier pair of rain pants to keep my legs warm. Gear: Several of my dry bags ended up with water in them. I need to test them before taking them on the trail again. Sleeping Bag: I use a torso length sleeping pad and lay my feet on my backpack at night for padding. With two days of rain my backpack was soaked and saturated my sleeping bag. I have ultralight plastic sheets for my ground cloth and should use one to wrap the top of the wet backpack to keep my sleeping bag dry. Food: I carried my typical ATfood, Pop Tarts, couscous from a Gatorade bottle, cold instant mashed potatoes, beef jerky, and a smattering of trail mix, Snickers bars, and granola bars. This worked on the AT, but trying to hike fast and far was exhausting and I had no ambition to prepare food for dinner, so, I didn’t. In 2 days I lost 4 pounds, and I can’t afford that! I’ll test meal replacement packs and bars that will be more efficient to eat than my traditional fare. Schedule & Direction: I’d intended to start my hike earlier in July but didn’t feel prepared. I actually didn’t know that Colorado has a monsoon season, but I walked right into it. Next time I’d like to start earlier in July, probably from Denver, and time it so the snow has just melted and I’m finishing in Durango before the monsoons start. I was bummed to pull off the CT after only two days, but, I didn’t feel safe. It was a lesson learned and I definitely plan to return to hike the Colorado Trail fast and light! Know how you feel. It felt like a failure when I had to leave the CDT due to physical problem. But agree saftey is the first issue. Another day, another time. Glad you are safe and enjoy your posts. Hugs to you Tarzan.